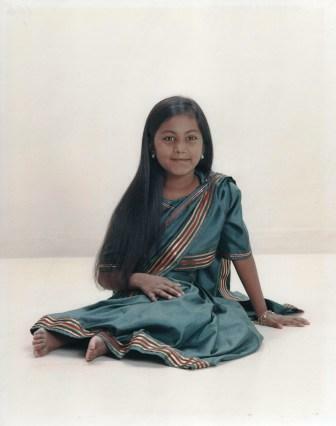 Sarah was found wrapped in a cloth on the edge of a street by the Delhi police. 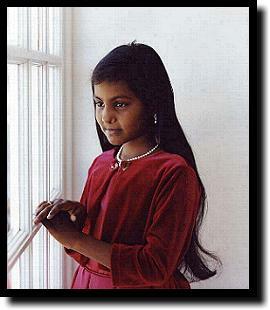 She was taken to a small orphanage in Old Delhi, India called "Palna," meaning the cradle. It is named this because there is a tiny cradle with a bell near the entrance of Palna. Here mothers can leave their babies in hopes of them rec eiving the care they need, without the birthmother having to identify herself. The caretakers estimated Sarah to be approximately six months old. 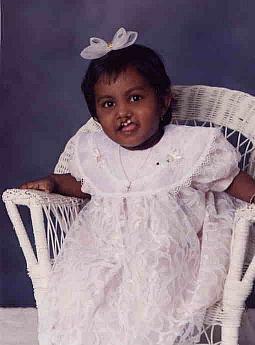 Sarah was born with bilateral cleft lip and palate. She was severely malnourished and had no prior medical intervention. At the age of thirteen months, Sarah only weighed eleven pounds. There is no way of knowing what happened to Sarah’s birthmother. 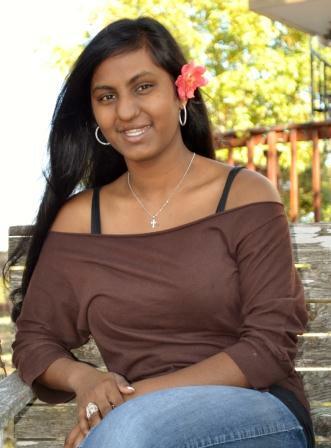 The police searched for her, but no one was found. After several months, it was decided that adoption would be the best alternativ e for Sarah. It was by God’s grace that we found Sarah. We were prepared for a 4-6 month wait for a referral of a baby. Much to our surprise, we got a phone call only a few weeks after we entered the India program. Our completed home study had landed on the Holt International’s India program director’s desk at the same time Sarah had been refused by yet another adoptive family. The director told us that he read our home study and her referral documents and that he just knew we were meant for each other. On July 4, 1997, Jay boarded an airplane for Delhi, India. It was the first time we had ever been apart since we were married. It was a scary experience for both of us. We had made the decision for one of us to travel while the other stayed home with our two biological sons, Jacob and Joshua. After 22 hours in the air, Jay arrived in Delhi. It was his first time to travel out of the United States and he was shocked at what he saw in India. After a wild ride to his hotel, he noticed that it was already 4:00 am. After a couple hours of sleep, he decided to take a walk. He didn’t know where he was going, but somehow ended up at the front gate of Palna. He told the guard that we were adopting a baby and he let Jay in. Palna was an orphanage in need of much. It was evident that the director did as much as she cou ld with a very limited amount of funds. There were no beds for the children. They slept on the floor on thin little rugs that could be rolled up during the day. Many of the children’s heads had a flat area to the back due to spending so much time on their backs on a hard surface. There were no toys or items we are accustom to seeing in western children’s homes. The babies wore thin cloths of whatever material they could find in place of diapers. Like most orphanages, they had a routine schedule so that all the children could be taken care of properly. Jay met the doctor on staff and he took Jay to meet Sarah. It was not the meeting we had dreamed of for several months. Sarah was very scared and refused to have anything to do with Jay. She wouldn’t even look at Jay. She was in a group with about 50 other two year old children, yet she seemed to be all alone. The other children interacted with Jay and gave him hugs. Jay tried to pass out candy, but before he knew it the children had removed every piece from his pockets along with his passport! The caretakers brought Sarah to Jay, but she cried non-st op for almost two hours until Jay left. Jay returned to Palna the following day in hopes of a smoother visit with Sarah, but it was only a repeat of the previous morning. The following morning brought the same results. Jay called home to tell me that God had definitely given us the child who needed a forever family the most. He was very concerned for Sarah. That afternoon, Jay held Sarah for the first time. The caretakers had him take Sarah outside into the courtyard. Jay showed her a squirrel and some birds. Jay noticed other children come up to Sarah and make fun of her cleft lip and palate. She would hide her face in shame or hit at the other children. Soon after, she fell asleep in his arms. It was the first time that Jay was actually able to look at his new daughter. As she slept in his arms, Jay studied her face and told her that no matter how hard she fought him that he was not going to give up on her. He told her all the things that he had hoped to tell her on their first visit. Sarah slept in his arms for over two hours. When she woke, it was time for Jay to return to his hotel room. Jay called home that night to tell me of his meeting with Sarah. He told me how he held her and how s he seemed so tired and slept for hours in his arms. The more we talked about the experience, it started to cross our minds that maybe Sarah had been given some type of medication to calm her. When Jay returned the next day, Sarah was eating lunch with the other children. Jay sat near her and the caretakers gave him her cup and bowl, but Sarah only took a few bites and then refused to eat when Jay helped her. She was hungry, but was making it very clear that she did not want anything to do with this new person in her life. In the afternoon, Jay and Sarah had to go to the embassy to complete the necessary paperwork. The orphanage director sent a caretaker with Jay since Sarah would not allow him to hold her. Every time he tried to play with Sarah, she cried. He sat and watched her play alone. It was almost time to return home and Jay wondered how he would manage to get Sarah home. Their flight left the next night at 12:30 am. The orphanage director did not allow Jay to take Sarah from the orphanage until the afternoon before the flight home. Our thoughts of Sarah being medicated on the day she allowed Jay to hold her were confirmed when the director gave Jay some medication to help calm Sarah until she arrived home. The director told Jay not to take Sarah into the hotel until she was calm enough to go in. The driver took them to the pool area of the hotel. After about an hour, they went inside the hotel. When they entered the room, Sarah walked around the room until she found the bed. Jay put her up on the bed and she collapsed on the fluffy pillow. It was something she had never felt before. After a short nap, Jay gave her a bath and dressed her for the flight home. She was fascinated by her shoes. She was not accustomed to wearing shoes, but she w as very excited about them. Jay gave her some toys too. Jay told her that it was time to go eat dinner and motioned with his hands. He started towards the door, when he noticed tiny little Sarah gathering the pillow, her toys, and everything Jay had given her. She could hardly walk because her hands were so full. Jay decided that maybe room service was a better plan! Sarah ate all of her food very quickly and then she ate Jay’s food too. They played until it was time to leave for the plane. Sarah changed so much in the time she had alone with her father. She became very attached to him. Finally, he was not the stranger any longer. Jay was the only familiar face she saw. During the flight home, Sarah did not sleep until the final flight from Dallas -to Houston. She only cried during take-off in Delhi. The flight home was twenty-two hours of "shoes-off, shoes-on". Sarah loved her shoes, but she could not stand the feeling of wearing shoes for very long. Jay never used the medication on the flight home. Sarah did fine without it. I did not know what to expect when Jay and Sarah arrived in Houston. Jay had tried to prepare me. As they came through those big red doors, my first thought was of how tiny she was. The 12-18 month clothing I had sent with Jay was huge on her. Her eyes looked so full of hurt and pain. When I put my arms out to hold her, she came to me, but the moment was short. She wanted her daddy back. I attempted to hold her again, but this time, she slapped at me. I’m sure my tears made her even more scared. There were so many new faces and everyone was in tears. Our friends and family came to our house for a short visit. Jay was so exhausted, so we went to bed early. The orphanage director told Jay to keep her in our room for awhile because she was not accustomed to being alone. That first night, she slept between us. In the middle of the night, Sarah woke and made it very clear that I was not supposed to be in her bed or near her daddy. I couldn’t understand Hindi, but her expressions and hand movements were very clear! I grabbed my pillow and crawled in bed with Joshua. Several hours later, Sarah was up again. This time I took her downstairs to "make friends" over a meal. I gave her bananas and nutri-grain bars. I turned on the lights outside and we watched our dogs thro ugh the window. I showed her the toys and read her a book. After a few hours, we returned to bed and slept till morning. Sarah ate like each meal was her last. She hid anything she couldn’t eat, just in case there wasn’t enough food the next day. She was a survivor! Perhaps the determination Sarah had early on is what kept her alive. Each day, Sarah relaxed a little more. She began to play with her brothers and her personality changed. She went from the little girl who hid her face to a little girl full of confidence. We told her how beautiful she was and how much we loved her. We dressed her up in pretty dresses and bows and stood her in front of the mirror to show her how beautiful she looked. She brought us so much joy. 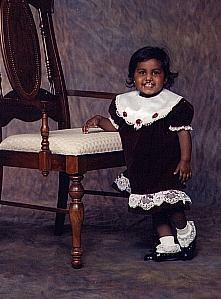 Her smile, cleft lip and all, was infectious! Those first few weeks home brought a renewed hope in Sarah. God had answered our prayers and brought us a child who needed a forever family and a home desperately and he gave us such a precious gift in that special little girl. 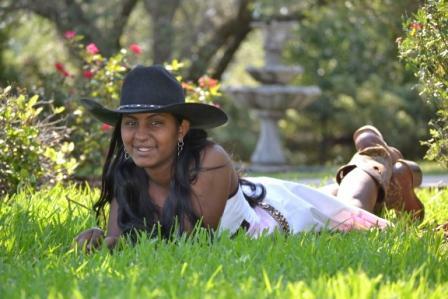 Sarah has had several surgeries at Texas Children’s Hospital for her cleft lip and palate. Each one has been difficult, but has made good progress in her medical condition. 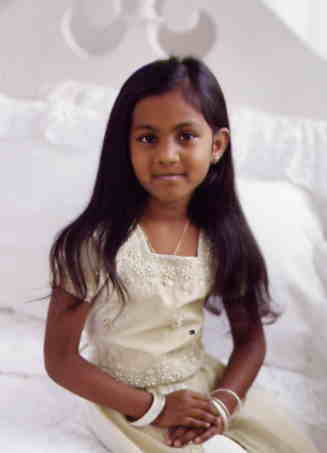 She attended a speech class until she was five years old. Sarah’s first speech therapist suggested that we teach Sarah sign language, because she felt her speech would never be clear. We felt that Sarah needed encouragement to use her voice and we chose not to teach Sarah sign language. Later, another speech teacher told me, "She was the most determined little girl she had ever met." Sarah worked hard to get out of speech therapy. We would play games and chase cotton balls across the floor, blowing them with straws to help build the muscles in her throat. We tried to make speech practice fun. Today Sarah is seven years old. She is such a beautiful person both inside and out. She loves the Lord and has a great love for others. 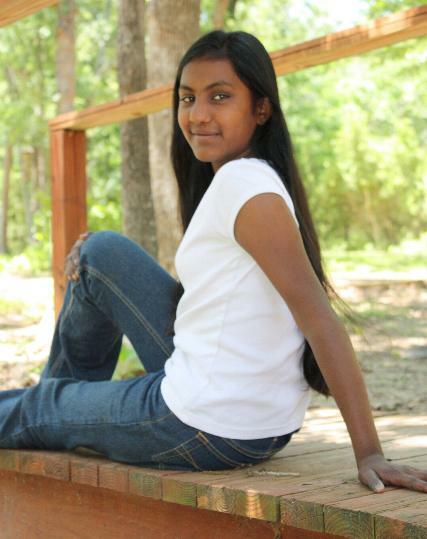 She learned how to read when she was four and half years old and has done well in school. She takes tap and ballet lesson s each week. She loves to dance. 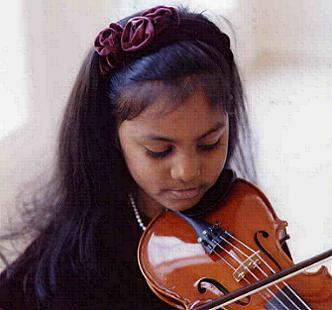 She has played the violin for one year now and has made great progress. Sarah even tried roller hockey for a year and was awarded "rookie of the year." We think she just had to show her brothers she could do it! We know that God has a very special plan for Sarah, as he does for each of us. One of our greatest joys has been watching Sarah blossom into the beautiful young lady she is today. We are so thankful that God chose us to be Sarah’s parents. 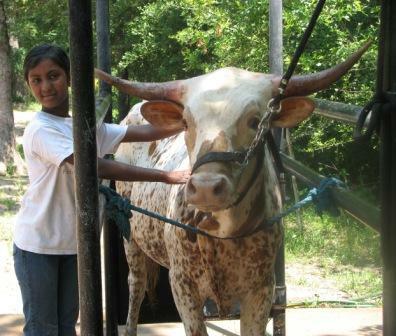 Sarah showed Texas Longhorn Cattle since she was ten years old. 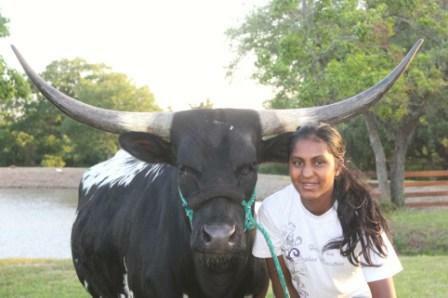 She was awarded the Texas Longhorn Breeders of Tomorrow Hall of Fame Award in 2008. 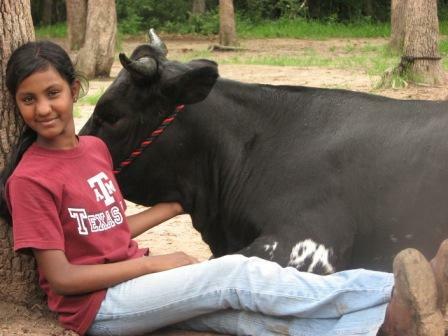 She was elected to the office of 2008-2009 Teen Director of Texas Longhorn Breeders of Tomorrow. 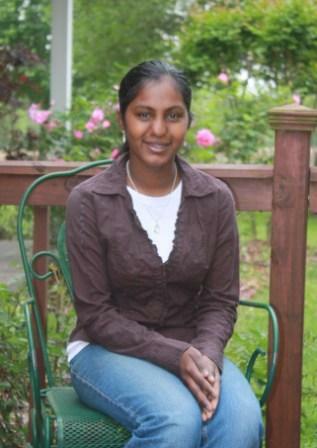 She was a 2008 TLBT Quiz Bowl winner, a TLBT Judging Contest winner, and a Gold Merit Contest winner. 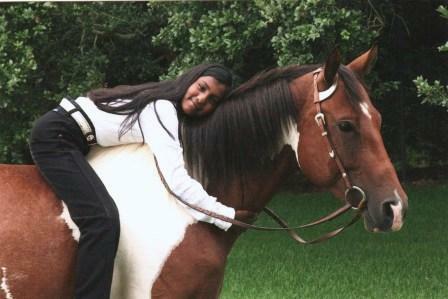 In 2008, Sarah competed in the Houston Livestock Show Go Texan team penning contest. 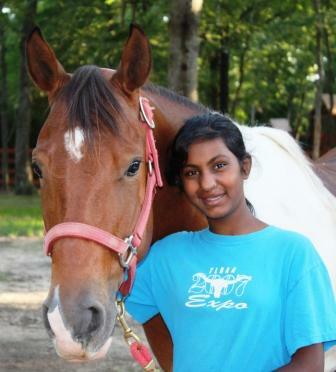 With a horse that she trained on her own, her team went to the finals and placed 3rd overall. In 2009, Sarah was elected to the office of TLBT Reporter. While serving in this office, she created the TLBT newsletter, entitled “The Horn.” Sarah received the 2009 Autobahn Teen All-Around Champion Award, which is given for excellence in showmanship, speech contests, essay contests, cattle judging and more. 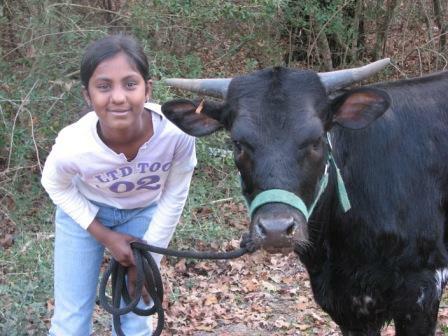 She won 1st place in the cattle judging contest at the 2009 TLBT World Show. In 2009, Sarah made the TLBT Hall of Fame again. She was also a Gold Merit Contest winner in 2009.